This is a true story. No instructional designers or facilitators were harmed…threatened a little…but not harmed permanently. “Personally, I could give a rip if you guys want to use Miller Heiman or Holden Power-based Selling or something homegrown…just pick something! Pick something and take a stand…something everybody can get behind and reinforce. “Yes indeed, that’s going to be the evidence we’re looking for.” Bob agreed. Okay, so I just received thanks for a job well done. Permit me to turn the clock back a couple of months to the leadership team’s original request for a new sales training program. This look back will help position the approach and risks taken to get to this rewarding compliment from Bob. Being the newly hired Director of Sales Training of three weeks, I had pushed back on their request for a new selling skills course, but not before giving the standard performance consultant reply, “Sure we can do that…but…” Performance consultants always add a but! “…but first, let’s make sure we’re investing in the right place to correct the underlying source of the problems…and not just throwing cash at symptoms.” Sitting around the executive board room table they eyeballed one another and then reluctantly agreed. You could tell they had already decided that this sales performance issue would ONLY be solved by a more aggressive training approach; proof positive that each was snug as a bug in the comfort of a familiar training paradigm. Gaining their agreement, I had either dodged a bullet or had stepped right into the middle of an active mine field. After all, who would even think that wasting time asking questions of the very people needing improvement made any sense? They knew the drill – Training drove performance – I was Director of Sales Training…so train our people, big guy! The following six week front-end diagnostic assessment covered six sales regions with six top gun sales SMEs selected from each region, as well as six Sales Managers who all separately participated in a series of interviews. I’ll not delve into the discovery effort here, choosing instead to fast forward to the big reveal that took place in the very same executive boardroom where this perceived waste of time began. Every eye in the room shot down to the end of the table where the Vice President General Manager sat. He was the guy who hired me three months earlier. He was the guy who thought the performance consulting skill set I carried was what the organization needed in the Sales Training Director role. He was also the guy eyeballing me with a fierce ‘this-better-be-really-good’ look. I don’t recall if the air had been sucked out of the room at that moment or if everyone had just deflated simultaneously. Either way, I managed to not step on one of those land mines I feared, and appeared to continue moving forward with my audience in tow. They did not know it yet, but we had just taken our first steps toward flirting with adoption of a performance paradigm. I had successfully hidden the performance pill in the training cheese. Okay, let’s move the clock forward to the caffeine and conversation of that Monday where I started earlier. “Many things are not happening the way I think they should. The product development cycle is not performing well. Competitive pricing is a struggle. Marketing Communications is not aligned with Product Management and Promotions.” Bob lamented, his voice trailing off like he pondered more issues. This was great, I thought, another diagnostic opportunity already on the radar and fresh off a successful first mission. “Okay, that helps. I should do another performance diagnos…” I started to describe the logical next steps before Bob yanked me off the rails. Moving to the lite version amounted to a covert performance consulting “ninja” move…meaning I was still going to accomplish another performance diagnostic assessment but in a more stealthy manner. Actually, this was more like getting an agreed upon approach from the stakeholder, lying convincingly to his face, and then doing what was necessary to find the root causes behind the less-than-world-class performance of Bob’s marketing staff. What I uncovered shocked me for the most part. The distribution of performance restrainers was scattered over six categories; making a formal “training” recommendation impossible because there were too many other moving parts…to many root causes. A training solution that relied upon a brand spanking new marketing curriculum would never touch the most profound performance gaps. I found myself at a decision point. Take Bob’s order for training and give him what he wanted, or put the real reasons his world-class aspiration were waaaay out of reach of upgraded training on his desk…and shine the light on how performance was not going to be world class no matter how good the new marketing curriculum might be. It’s called improvisation. My proposal consisted of a single sheet of paper with a big pie chart centered on it. I had all my verbatim responses in a folder that I “Billy Grahamed” during our conversation but never had to consult; we never got that far into our meeting. I mean really…what was left to consult when the SVP Sales & Marketing had just been blown out of his socks with the results of a covert consulting effort? Bob sat back, steepling his fingertips in front of his lips, and just stared at the pie chart. I’m not sure if his silence was driven by clear evidence that he might actually be part of the problem, given leadership ranked third, or if I’d simply ripped open Pandora’s Box on his desk and he mentally needed time to sort through his options. Truly, there really weren’t any options to consider with the hard evidence from his own team staring him in the face. What morphed out of Bob’s I-don’t-have-that-kind-of-time resistance posture launched a Six Sigma Black Belt initiative to tackle the workflow and process issues; a marketing attitudes and values survey requiring every staff member to participate, and yes…with the proper focus and survey results in hand…an out-sourced Marketing University curriculum evaluation and rebuild effort from world-class marketing gurus. In all, it took 14 months to stabilize the Marketing Learning and Performance Ecosystem despite not-having-that-kind-of-time. Back to that minefield I mentioned. The larger risk in taking a ‘performance’ approach over just taking an educated swag on a new Marketing curriculum was not that the ultimate outcome that failed to improve the training outcomes, it was enduring what I guarantee you would certainly happen next. Therein I knew the danger existed…navigating the minefield…ducking and covering because what would’ve come next were the endless meetings to explain why performance across the Marketing team had not improved to world-class level. 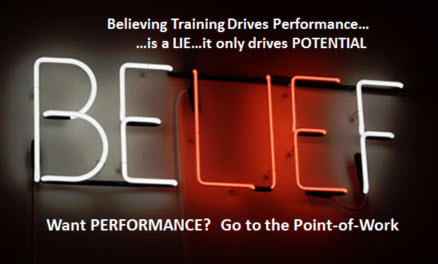 After all, we now had world-class training in place, and being further blinded by the myth that training drove performance…only one question can be asked – What gives? Been there…done that…too many times. Honestly, I’ve failed before…failed by being excellent in the role of taking orders from stakeholders who are blinded by a Training Paradigm; blinded by a belief that training drives performance; and then they admonish L&D when all they get is potential. That’s all they ever get…ever got…POTENTIAL…but hey, its potential we can measure…we can prove our success with course level evaluations. Having been down this road before, I can say with confidence that I’ve finally defined the hill I choose to die on. Too bad it took so many years to get there. Performance happens at the Point-of-Work…ONLY at the Point-of-Work. If it’s performance you seek…GO THERE FIRST! And there you have the entire point of this story. If I had not gone downstream to the Point-of-Work with a performance diagnostic, I would’ve only been 100% effective on 18% of the problems…and left standing in the middle of the minefield waiting for another call from Bob to explain my way out of what my key stakeholder could only see as a major screw-up. My screw up…an epic Training fail! The simple act of placing that pie chart summary down in front of a stakeholder who is paradigm-challenged is the perfect…repeat…perfect conversation starter you can have without ever saying a word. Simply point to what training cannot do to help. …and then you’ll dance like only a ninja performance consultant can dance…right before spiking your folder full of verbatim interview responses like a crazed wide receiver slamming a touchdown pass into the ground in the end zone.